John Tory evades transit questions, loses cool, and echoes history. Photo by John Tavares from the Torontoist Flickr Pool. Yesterday was a victory for John Tory and his Council allies. At long last, the mayor passed a series of motions about the future of Toronto’s transit network, and he got what he wanted. This includes Council support for the one-stop, 6.2-kilometre subway extension in Scarborough that will cost $3.2 billion. At the same time, Council voted down a proposed seven-stop LRT in lieu of the one-stop subway, although the LRT would have cost less money, carried more passengers, and would operate sooner. Although Tory was on his way to certain victory, that didn’t stop critics of his transit plan from taking a stand to articulate their opposition. And just before Council voted to approve the plans, when Tory responded to questions from Josh Matlow (Ward 22, St. Paul’s), the mayor didn’t look good. Before the exchange between Tory and Matlow, the mayor gave a speech about honest debate, why he supports the one-stop subway, and the mandate for his mayoralty. 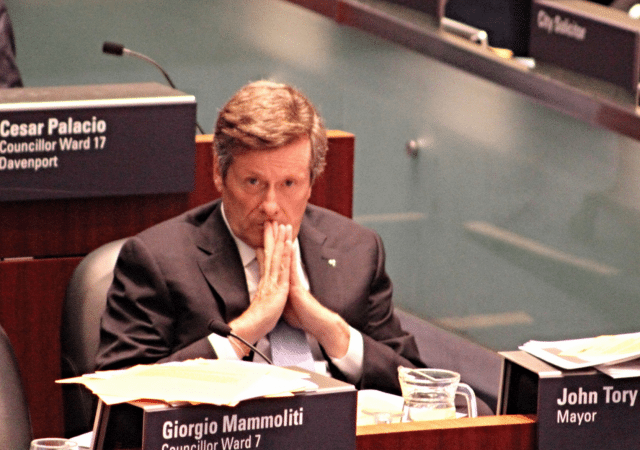 While Tory made an appeal to unify behind the Scarborough subway extension, the underlying facts to support the argument are questionable at best, and flat-out wrong at worst. The one-stop subway extension will decrease job accessibility by 0.7 per cent compared to the existing SRT, according to the staff report. A seven-stop LRT would have served 8,000 people during the peak ridership hour compared to 7,300 for the one-stop subway, and more than 10 times as many people (47,000) would be in walking distance of transit. The LRT route would also better serve the Neighbourhood Improvement Areas that Tory invokes. There’s a significant dissonance here. By almost any measure that Tory cited, the LRT plan would actually serve his stated goals better. It’s this disconnect that Matlow, the leading critic of the mayor’s one-stop subway on council, sought to highlight. He asked Tory to substantiate the following claim he made in his Toronto Star op-ed “Why I Support the Scarborough Subway“. They found most people taking transit downtown from Scarborough are students who want to connect directly into the core, which makes multiple stops along the way unnecessary—on an LRT or a subway. The analysis favoured an express subway extension above the original light rail. The mayor evaded the question, and did not substantiate the claim in his op-ed. Matlow followed up, and asked the mayor again to back up his claim. Then John Tory lost his cool. He began as a Disappointed Dad, but his tone—even in victory—quickly turned angry and condescending. I would say to you that I think if you look at the content of the article that it dealt with the proposal we put forward here today, because that’s what was under discussion at the Executive Committee and here, which is not one particular part. In fact, I would say that’s part of the shortcoming of this debate is that some people have chosen to focus on one part of this exclusively, and, frankly, one of the only disappointments I have in the debate is that many of the people—not all—I’ll give some credit—not all-many of the people—but I will include you in this group—have failed to accord an ounce of legitimacy to the notion of using all modes of transit, including a subway. Not an ounce. And you had different reasons over time. First it was, you know, that you just like the LRT. And then it became ridership. And that became a bit tough because the ridership numbers actually showed it was going to be one of the busiest stops on the subway. And then it became costs, but that became a bit tough because the costs actually grew almost together. So it’s gone from almost one reason to the next, but no matter what the answer is on the facts, you don’t support a subway. And that’s fine. I’m just saying I do, and I believe it’s part of a plan, and this plan is going to be voted on in five minutes, and then we’ll see. And we’ll go forward from there. And I hope you will then cooperate with everyone here to actually get on with building the transit and not carry on for ever and ever and ever. Because I think people are tired of it. If a mayor evading questions from Matlow about a proposed Scarborough subway plan seems familiar, then you might want to check out the video below. When it comes to Toronto’s transit debate, everything old is new again.